The 62-year-old has been having chemotherapy for the disease as well as trying to overcome a bowel condition. His increasingly gaunt appearance had prompted press speculation that he was close to death. But the singer told BBC Radio 2 on Friday that he was feeling better than he had for more than a decade. "I am very active and my sense of well-being is good." The singer also said reports about the nature of his cancer had been conjecture. "I mean the fact is, I've never spoken to anybody about my condition or the condition that I was in and a lot of them go over the top to the point where they're telling me things that I didn't even know about myself." In January his spokesman said the singer had been having chemotherapy, and Gibb confirmed on Friday that he had been diagnosed with a growth in his colon. "Well, it's all simple. I was diagnosed with a growth in my colon. It was removed. And I've been treated for that by a brilliant doctor, and in their own words 'the results have been spectacular'." In April last year, Gibb was forced to pull out of series of shows in Brazil after he was taken to a British hospital with abdominal pains. In 2010 Gibb also had health problems, which also led him to cancel a series of scheduled public appearances and spend time in hospital. He went on to have emergency surgery for a blocked intestine. He had been performing in Belgium when he began to have stomach pains. The surgery resulted in the singer having part of his intestine removed. His twin brother Maurice died in 2003 due to complications from a twisted intestine. 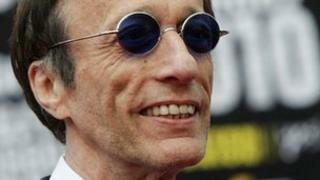 Gibb told Radio 2 that his recovery since falling ill last year had amazed the medical staff who have been treating him. "They said 'What are you doing that we don't know about?' and I said I'm not doing anything and in fact I haven't taken a single tablet. "I feel better than I did 10 years ago. I'm active, my appetite's fantastic, the plumbing is all in perfect working order. "If I had a choice about how I'd like to feel for the rest of my life, this would be it. If I wanted to tick all the right boxes about sense of well-being, it would be now. This is the way I'd like to feel. I don't know how I could feel any better." Gibb is soon to make his classical debut with the release of an album about the sinking of the Titanic. He will lead a concert performance of the album on 10 April, exactly 100 years after the Titanic set sail. Gibb's requiem is played by the Royal Philharmonic Orchestra and features the RSVP Voices Choir, in addition to vocals from tenor Mario Frangoulis and British choirgirl Isabel Suckling. One of the pieces, Don't Cry Alone, also features Gibb's first studio performance since last year's charity single I've Gotta Get A Message To You. The requiem is not the star's first collaboration with his son RJ (Robin-John). The duo recorded a song for independent vampire film Blood Type - The Search in 2009, in which RJ also had an acting role.